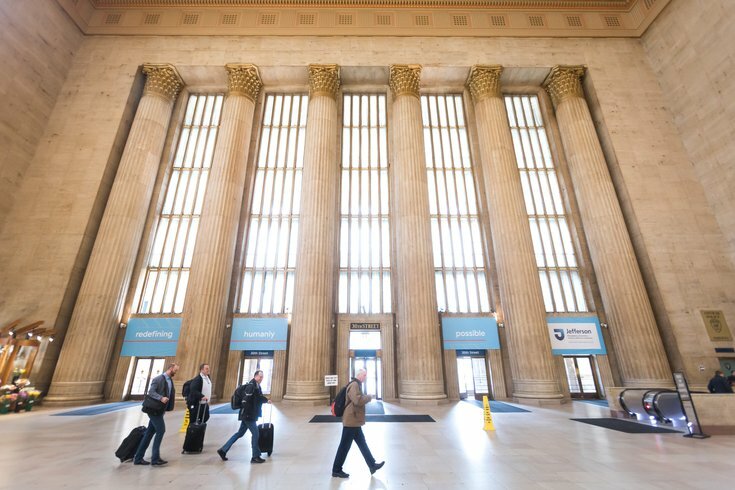 The interior of 30th Street Station in Philadelphia. Two years after SEPTA Key launched to modernize Philadelphia's transit fare collection, Regional Rail riders will be brought on board for the next phase of a systemwide rollout. Over the next two weeks, the two busiest stations in downtown Philadelphia — Suburban Station (July 16) and 30th Street Station (July 23) — will both activate the turnstiles that have been installed for the platform entry of Regional Raid commuters. SEPTA Key turnstiles opening at 30th Street Station. Beginning earlier in July, SEPTA sent a team of ambassadors out to the Center City stations to provide information and orientation for new and future users of SEPTA Key. The reloadable fare card has already displaced the token system on Philadelphia's subways, buses and trolleys. Leslie Hickman, SEPTA's chief officer for revenue operations, explained that about 70 percent of Regional Rail riders currently use daily, weekly and monthly passes for their commutes. They present their paper passes to the conductor for validation once they board the train. "In the future, you won't have to present that fare to the conductor," Hickman said. "You can validate it with the SEPTA Key at our free-standing, stainless steel posts. Riders just tap to initiate a trip." The advantage of SEPTA Key for Regional Rail is that it will enable these pass holders to independently manage their travel budgets instead of waiting in lines to purchase new passes. Riders can set up the auto-load feature with SEPTA Key to have their passes refilled as needed. New turnstiles installed at the five main Philadelphia stations will now serve as the primary point of fare collection. Tickets will still be available at the station sales office, but cash will no longer be accepted aboard the train Monday through Friday from 6 a.m. to 8 p.m. Outside those windows and on weekends, payments can still be made to the conductor. 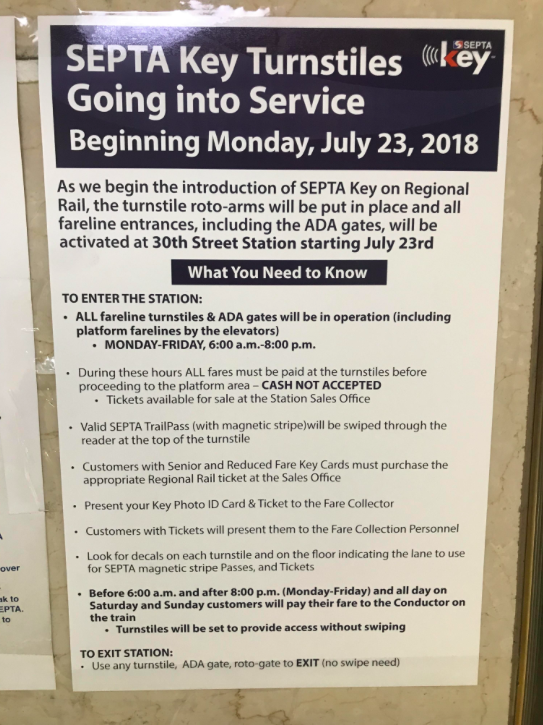 The turnstile rollout at SEPTA's two busiest stations marks a big step forward for SEPTA Key, which will be fully deployed at all Zone 1 stations by Aug. 1. That date will also spell the end of paper transfers. Customers are can learn more about SEPTA Key here and register their cards once they have obtained them.